At ten weeks and ten months. The Ohio E’s consider their progress as they look their former and future selves. Hold onto your britches, folks, as we direct your attention to the nearly inconceivable factoid that Euka II and her E littermates are celebrating their ten month birthday today. Yep, indeed the little furry cotton balls we met seemingly just a few weeks ago are growing into the amazing dogs they are destined to be. The precious Euka is not our little girl anymore [sniffle]. I could lament over this puppy growth in the same manner as I deal with the knowledge that I’m the parent of a college grad. Sometimes it hits me all at once and I sit wondering how I could possibly be old enough to have a kid out of college. What the heck just happened here? I think. Wasn’t he just working on his science fair project in middle school? So putting things into perspective, watching a ten month old puppy grow is not as impactful to my fragile self-esteem. Our lovely Euka has gone from a bouncy carpet stainer to her canine teenage phase and you know what? I’m still pretty much the same age as when we got this thing started. And there you have it. Yet another wonderful thing about volunteer puppy raising. The benefits are just never ending with this gig. We had the Ohio E’s together for a training session a couple of weeks ago. 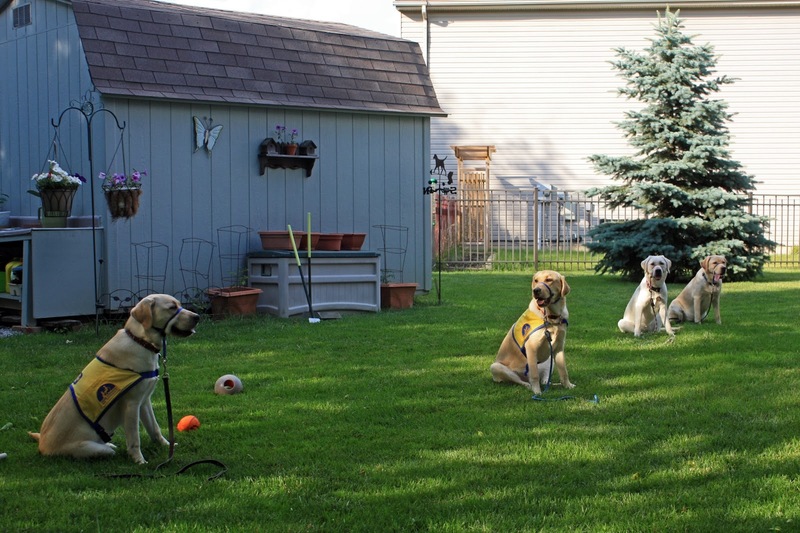 When Ella, Emma, Everett and Euka were a young two months old, we introduced their puppy noggins to some new experiences during a group training. You can see what we covered back then in the post Time to Ramp It Up. In this next session, our maturing pups were proofed on commands for a greater proficiency and asked to do a few new things as well. In this photo on the left our E’s are in a Sit with an implied Stay. 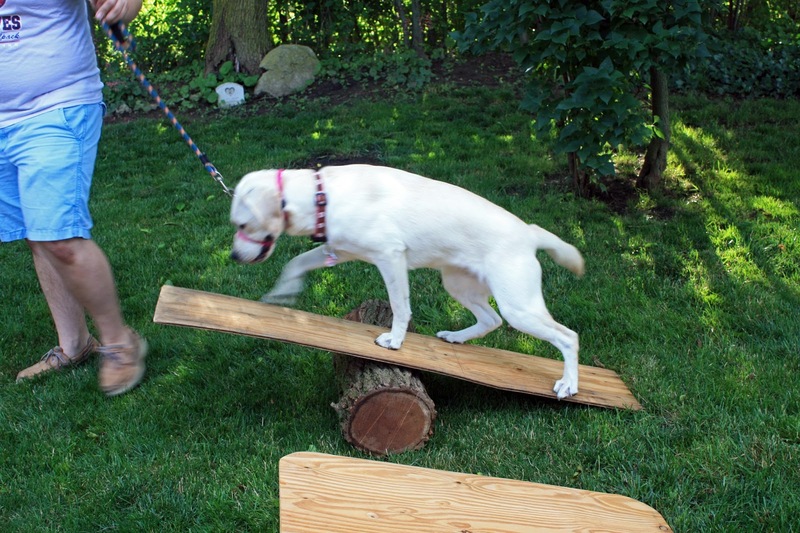 For CCI commands, a Sit or Down comes with the Stay command unspoken yet still attached. That is, the pups learn that they are being asked to maintain their spot until the next command is given. 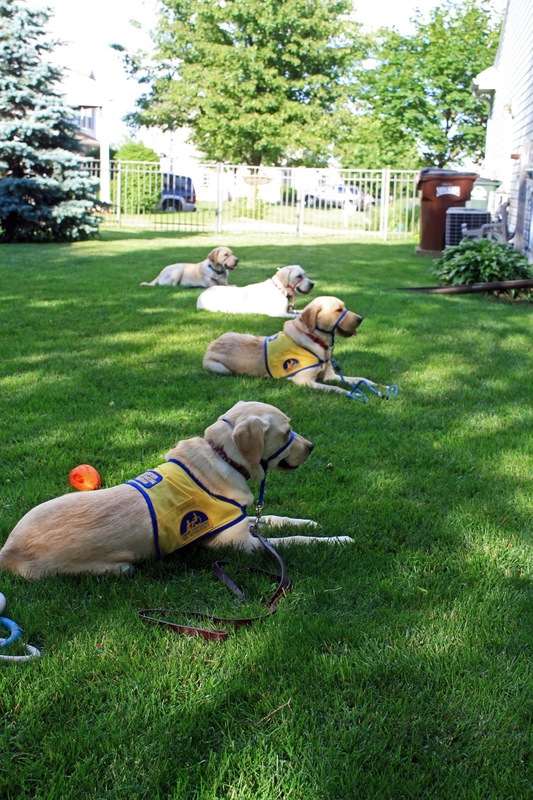 A very helpful mindset to have wired into their mindsets are they learn to be service dogs. And so as the pups mature, we extend the Sit/Downs with the implied Stays for longer periods. Puppy raisers are just out of the shot to provide a quick correction for any distracted furry thoughts. Should one of these E’s decide to move on from their Sit, they’re met with a verbal correction and get their bum placed right back to spot they were warming up just a moment before. See the orange thing by Ella? Yeah, we were tossing a football dog toy into their space for the extra challenge. Pretty much the same things going on here with the photo on the right. To proof the Down command we walk between, around and step over them. And yeah, the orange football has a bit part here again in this scene. Note the pups are in a sternal position and we also like to see them roll onto a hip. Alert, but relaxed is what we’re looking for here. Our training facilitators, Emma’s puppy raisers, have provided some props to bump up the session for additional challenges. A ladder flat to the ground provides a walking experience over a novel surface. 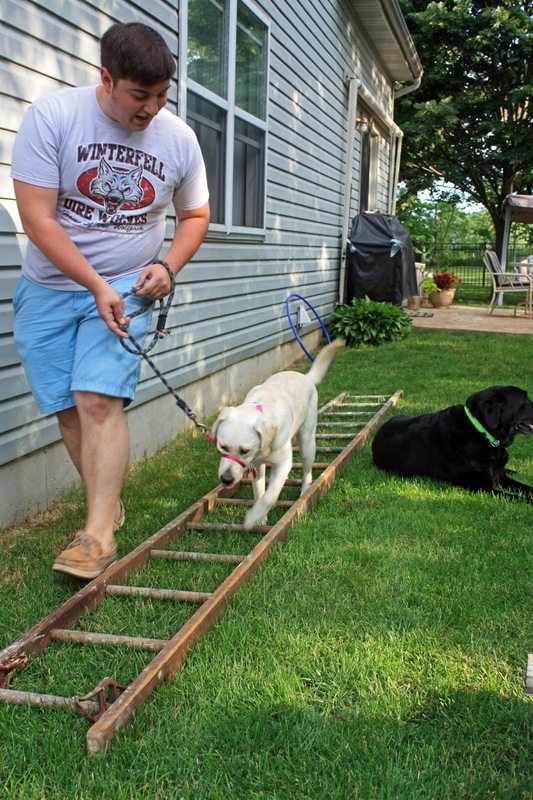 A teeter totter and a wobble board is set up to help with puppies adjusting their walk and overcoming any concerns about putting their paws on an unstable surface. And the tube, that glorious thing, is out again too. Everett and Ella at ten weeks old had enjoyed some camaraderie moments in the blue tube. 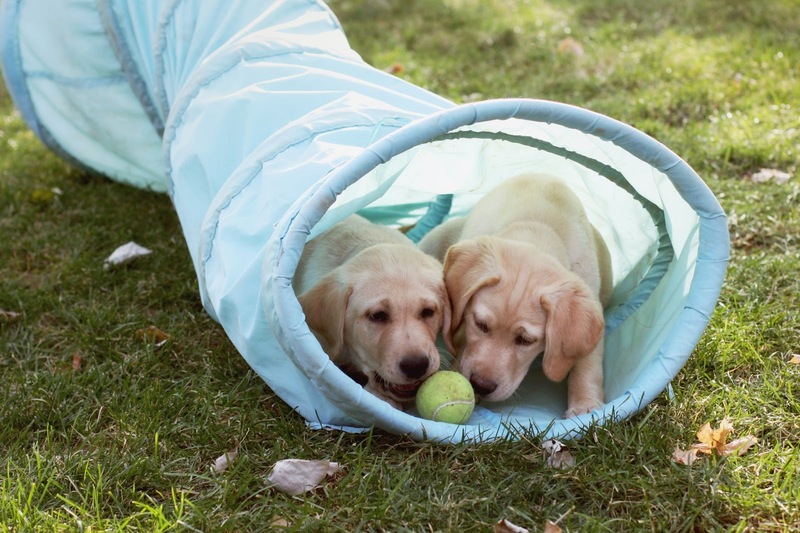 The two pups fit well within its confines and found the environment snug, yet comfy enough to move one’s body about for a robust wrestling match. This time around, they do still kinda make it in there together. But it’s more like trying to fit into your jeans from high school. Sure, you can stuff some leg in there, or for some of us maybe it’s just an arm, but it’s clear that the zipper isn’t going seeing any action. Any anyway, our confident *cough dominant cough* Miss Euka prefers ownership of the thing for her own purposes. 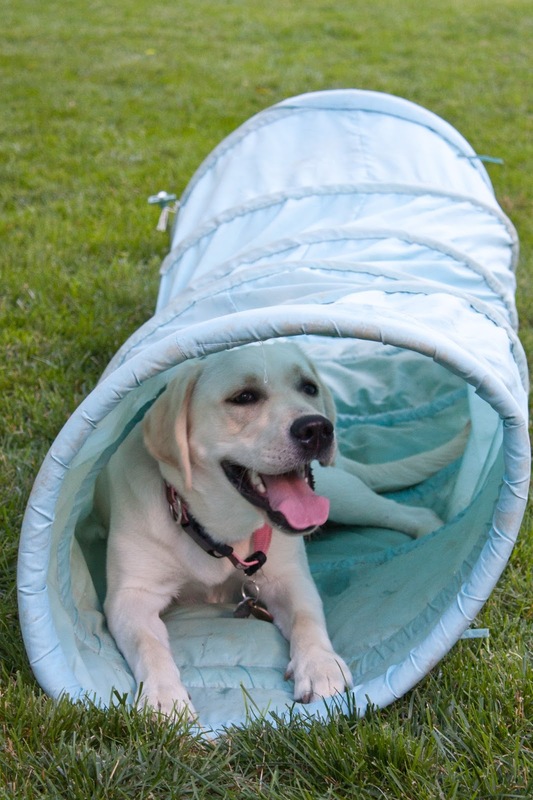 I have conquered the tube, says Euka. No kidding. I still have her pre-puppy raiser photos as my screen saver. But then, I also have my son's high school senior photo on my desk at work. It takes me a while to adjust, I guess.